Tulip trees are fall-foliage stars that get their name from the resemblance their flowers bear to the classic tulip flower. Tulip trees can be identified by the shape of their leaves: The concave shape of the tips of the leaves (or where you would expect a typical tip) makes the leaves look almost like someone took a bite out of them. Their leaves provide yellow to golden fall color. The flowers that give tulip trees their name are yellowish-green, with a touch of orange on the outside. Bloom time is late spring. Pollinators such as hummingbirds and bees are drawn to the nectar in the flowers, while bobwhites, rabbits, squirrels, and other animals like to feed on the seed. The cone-like fruit that they leave behind also offers some ornamental value. Tulip trees should be purchased from a local nursery and planted in spring to early fall. They'll fare best in a sunny spot in moist, well-drained, compost-amended soil. Bark mulch or wood chips will protect their shallow roots and help to keep the soil moist. Young trees need water and tree plant food. 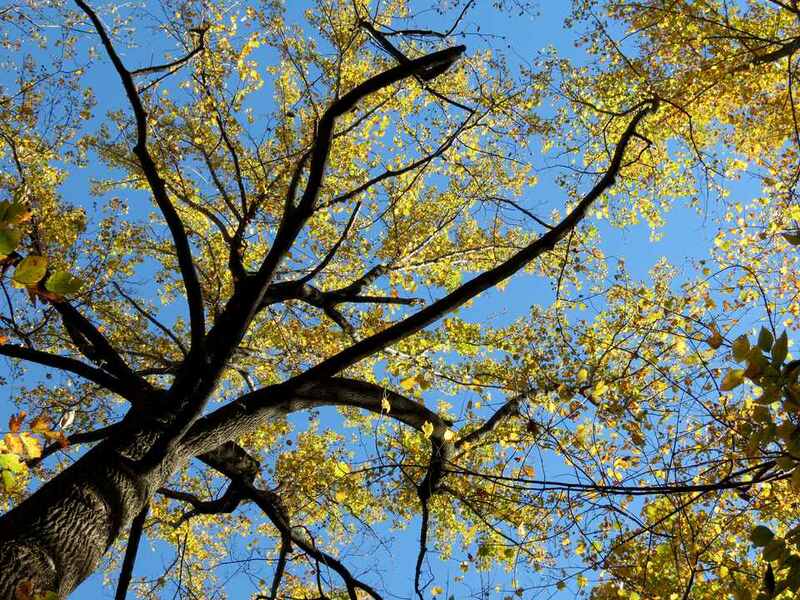 Size is a factor in deciding where to plant your tulip tree: They can reach 90 feet or more in height, with a canopy width just under one half their height at maturity. The branches begin rather far up the straight trunk and are often arranged symmetrically. These giants function in the landscape as fast-growing shade trees with fall-foliage interest. However, the trade-off for their fast growth is relatively weak limbs, which can create a hazard in storms. Tulip trees can be messy, as their flower petals will "litter" the area below just after blooming. The aphids that the tree attracts also make a mess with their honeydew secretion. They also are notorious for dropping sticky sap, so avoid planting a tulip tree near an area where cars will be parked—it's no fun trying to remove the sap from a car windshield. Grow tulip trees in full sun to partial sun. Full shade can stunt the tree's growth and cause its leaves to turn brown. The sunnier the area where you plant your tulip tree, the better. These trees prefer slightly acidic, well-drained, deep soil amended with plenty of compost. They can handle clay, sandy or loamy soils as long as the soil doesn't hold water too long. Don't plant a tulip tree in very dry soil, or soil that is too shallow. As you get your tree started, water it regularly during dry, hot spells and keep an eye on its leaves. If you notice the leaves drop earlier than usual (early fall is typical), this could indicate the tree is not getting enough water. This tree likes a temperate climate and while it prefers normal moisture levels, it can tolerate drought in locations with high humidity. Newly planted trees respond well to fertilization. Granular, liquid, or stake type fertilizers are recommended. Older trees generally don't require fertilization. Take cuttings in the fall, selecting branches 18 inches or longer. Cut the branch just outside of the swollen area where it attaches to the tree. Place the cutting in a bucket of water with rooting hormone added (follow the directions on the label). When you're ready to propagate, line a bucket with burlap and fill it with potting soil. Plunge the cut end of the cutting eight inches into the soil. Cover the cutting with plastic to hold in the humidity. Place the bucket in a protected area that gets bright, indirect light. Check for root development a few weeks later. Your tulip tree should be ready for transplanting by spring. Because tulip trees grow so fast, pruning is imperative. Their large branches can pose a hazard to other trees nearby, not to mention people walking beneath them. Remove dead and weak growth in late winter and early spring, and do a thorough thinning every few years. Tulip trees are immune to most pest problems. If a young tree is attacked by aphids, you can spray the leaves with insecticidal soap.